This useful, brief guide to Western opera by a longtime critic is a welcome curtain raiser for newcomers who have never experienced opera. 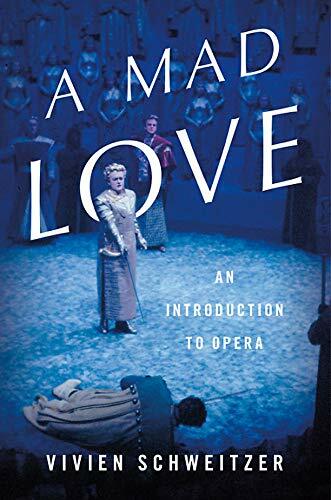 It is also a handy refresher course for those who have attended operas, seen or heard them on radio or television, but who still want to dig a bit deeper. Perhaps the most useful thing Schweitzer has done is to create a Spotify playlist so readers can listen to the overtures and arias she writes about as they read about them. In addition, her sprightly final chapters about current trends in production, venues, and the very latest works premiered in the 21st century brings the subject as up to date as can be. Schweitzer begins by defending opera against the naysayers who insist that the art form is past its prime, with the repertoire a mummified collection of dead material for old folks. “It’s a golden age for opera, and whatever the indisputable glories of the past, there are many fantastic artists who are both superb singers and much better actors than their predecessors. . . . it’s an exciting time . . . also because of the sheer diversity of repertory being presented,” she writes. The author makes an excellent case for the centrality of opera in the current performing arts landscape. Nothing, she says, replaces the thrill of hearing unamplified voices in a grand hall. She begins her survey starting with Monteverdi as the first great opera composer, whose work emerged out of hundreds of years of Western European tradition from troubadours to plainchant to Renaissance plays to liturgical dramas. In her discussion of this 17th century master, she works in definitions of the aria (Monteverdi was the first to insert a solo), comparing it to a soaring Shakespearean soliloquy. She also is frank about the appeal of the castrato, a young male singer castrated so his high pure voice would not break. Fans in Italy, she says, would shout “Long live the knife!” after performances of their favorites; castrati were “real showbiz divos.” But who knew that the last castrato performed in 1913? Monteverdi, Schweitzer writes, “used music to add depth and poignancy” to a dramatic story “in a way that his contemporaries had failed to do. He also broke new ground” with dissonant harmonies. Nevertheless, his works fell into obscurity until they were brought back in the late 19th century. Numerous operas that are now part of the standard repertory, including this one, were not successful at their premieres. This allows the author to insert a nice tidbit about the plaques of booing patrons, especially at La Scala in Milan to this day. Verdi and Puccini, Bizet and Tchaikovsky and Janecek—the progress of Italian and French opera as well as nationalist streams like Russian and Czech—follow. Detours into opera conductors, feminist objections to opera heroines as victims, verismo, and the question of casting non-white roles enliven the journey. Perhaps the smartest choice Schweitzer makes is to devote nearly a third of her text to 20th and 21st century operatic contributions, since so much of the “modern” and contemporary efforts are vital yet often under-appreciated by the old-school opera crowd. Of course, nothing could be more shocking than Strauss’s “Salome,” in which the heroine dances while stripping off her veils and kisses the beheaded Jochanaan. All this in 1905! By comparison, almost every scene in every opera that came after that premiere seems tame, but the music became more dissonant and louder, with Strauss himself writing for huge orchestras. Berg, Gershwin, Weill and Britten advanced opera into the last century. Philip Glass’s “Einstein on the Beach” is awarded pride of place as the “first important opera of the modern era, but Schweitzer is terrific in stirring John Adams, Thomas Ades, Missy Mazzoli, Jake Heggie, and other living composers into the mix. She devotes her final chapter to the new European directors of Regietheater, described as “radical and sometimes outlandish reinterpretations” of standard repertory works, “sometimes less politely called Eurotrash,” citing Luc Bondy’s widely hated “Tosca” at New York’s Metropolitan Opera. Finally she notes the end of “park and bark” immobile singers and the rise of convincing acting, thanks in part to closeups rendered by video transmissions. Schweitzer may have slighted some works—there is no discussion of Puccini’s “Turandot,” no mention of the two “Manons” and only a passing reference to “Fidelio.” Nevertheless, this is a valuable and blessedly concise addition to the literature.